If you need to replace your old fridge but don't want to invest in new cabinets yet a counter depth refrigerator is your best bet. Same goes for when you want to upgrade the look of your kitchen quickly. A counter depth refrigerator gives an instant uplift to the look. Best for Budget Under $1,299 Frigidaire Gallery FGSC2335TF Affordable price point, smudge-proof stainless, LED Lights, 36" 22.2 cu.ft. Most Reliable Under $2,399 GE Profile PYE22KSKSS Overall super reliable and excellent factory service support, handsfree autofill water dispenser is a hit, 36" 22.2 cu. ft. Innovative Design Under $3,149 Samsung RF22K9381SR Showcase door for most frequented items, Flex Zone converts to freezer or fridge, 36" 22 cu. ft.
All Refrigerator and Freezer Under $3,599 Frigidaire Professional FPRU19F8RF 64" width, 38 cu. ft., Great style with built-in like trim kit, spacious to handle all of your refrigeration needs. We imagine that you have been to homes where a modern stainless steel door of a fridge is followed by a long and ugly back plastic surface that leads into cabinets. Well, that is the look that we don't aspire, and manufacturers now have a solution for you. 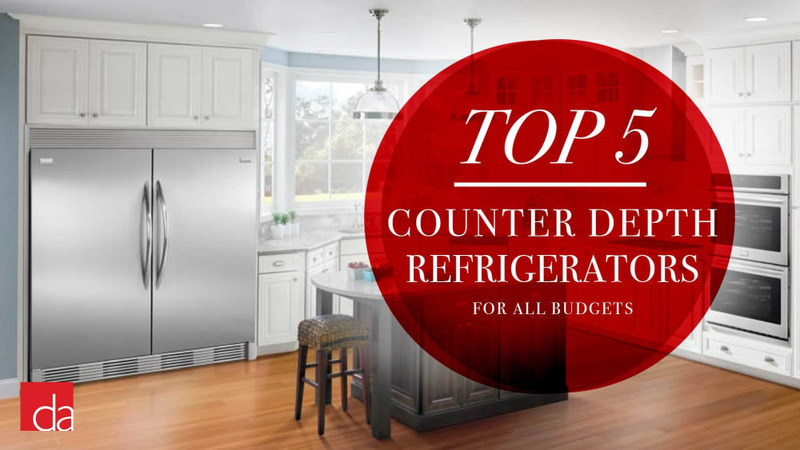 Without breaking the bank, you can now get a counter depth refrigerator that follows the contours of your cabinets and stands proudly in your kitchen. Most people are confused about terminology on refrigerators. Many of us mix up a built-in vs. counter depth refrigerators. Here is a quick hint on how to distinguish the two. Built-in refrigerators are flush with cabinetry and may be installed with custom cabinet panels for completely seamless integration. Price points will also give you a clue on built-in vs. counter depth. Built-in refrigerators usually appeal to the luxury market with prices over $5,000. Brands such as Sub Zero, Miele or Thermador dominate this space. Your kitchen will look tasteful and beautiful. Typically manufacturers price counter depth refrigerators a bit higher than their full-size options but pack in more features including a more flexible interior. Remember, kitchen cabinet depths are not standard. They can be anywhere from 24" to 26 1/2" deep. Besides, factor in not just the base cabinet but the backsplash thickness, handing countertop bullnose, etc. Best counter depth refrigerators do not come in with standard depth as the name might imply to an untrained eye. The main body (or as we call it the box) is typically 24" to 25" deep but in your overall dimensions factor in the door thickness and handles. Some models may also want you to have a small air gap behind. Beware of the height and what you have on top of the fridge. Remember counter depth fridges are not built-in and you cannot make them flush to cabinets as the hinges will not have space to turn. Also, you cannot install a custom panel on the counter depth fridges. An excellent price point for a counter depth refrigerator. Smudge-Proof Stainless Steel - Resists fingerprints for easy maintenance. Bosch makes high-quality appliances. This counter depth refrigerator is no exception, and it is listed with a pretty high price tag at $2,699. However, this unit usually has a $200 exclusive savings rebate in our store at Designer Appliances. On top of it, during promotional periods you will get an additional 10%-15% discount on a Bosch package that includes this refrigerator. All in all, a great Bosch counter depth fridge on or around $2,000 is an excellent deal. GE Profile is overall a reliable brand with great factory service. This particular fridge has been performing reliably for our customers for many years. Typical complaints we get revolve around occasional rusting which indicates that the cleaning crew in the household used harsh chemicals unbeknown to the homeowner. Occasional computer board issues that are covered under the warranty and modular replacement take care of the problem in a jiffy. Door alignment issues sometimes creep up as it is not intuitive for DIY self-installers that doors are adjustable. We recommend GE Profile without reservations. This Samsung refrigerator will stand out in your kitchen. You can be assured that you will get many compliments from your guests for choosing this fridge. Flex Zone compartment is a hit, and it converts one of the quadrants into a freezer or a fridge on demand. Thanks to Samsung's advanced technology your food will live longer in this model. Best price point in the market for a high-end, pro-style extra large 64" refrigerator and freezer columns. A smudge-proof stainless steel door is easy to clean and presents well. This set comes fully loaded with modern amenities such as an internal ice maker, LED lights, adjustable shelves. Use the innovative trim for the built-in look. Metin is the President of Designer Appliances. He was inspired to start this blog after he got fed up with reading sub-par product reviews from "leading consumer" organizations and "bot farms".